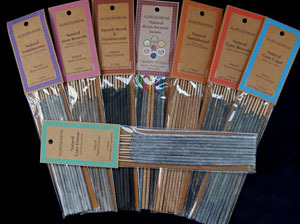 Natural resin incense sticks. Pure and natural resins but on a convenient incense stick that have been use for ages for their aromatic and therapeutic qualities. These come packaged in a resealable transparent cello pouch, with cardboard backing for protection and very affordable. Seven different aromas, and one sampler with all of them. Manufactured by Sri Aurobindo Ashram in Pondicherry India.